There was a major renaissance in porcelain production following the abortive attempt of Yuan Shikai to form a new dynasty in 1916. 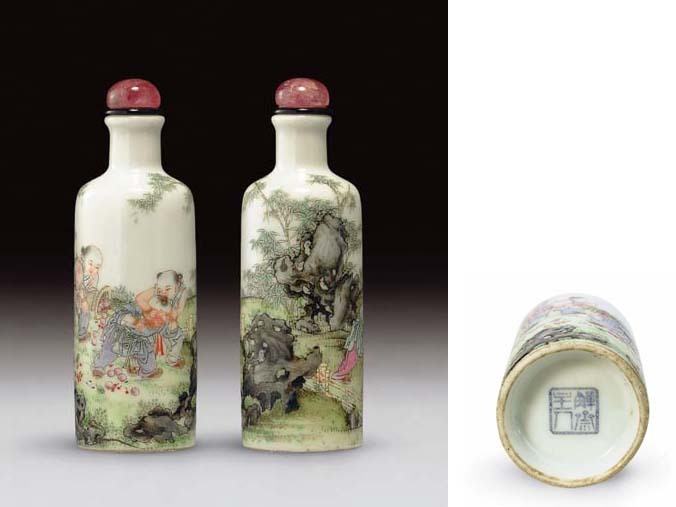 His lengthy preparations for rule included orders at Jingde Zhen for ceramics on a par with those of the Yongzheng and Qianlong eras, leading to some of the finest enameling ever produced at the center. These skills long outlived the new Emperor. Snuff bottles from this output are rare, since the habit of snuffing was dying out at the time, but when they occur they are often of spectacular quality, and this is no exception. The depiction of children in Chinese art has its roots in Buddhist and Daoist beliefs. By the Tang dynasty images of healthy children were no longer confined to religious art, but began to appear in on all kinds of secular art as an auspicious symbol. The depiction of little boys in the decorative arts became associated with the wish for sons, and through them posterity, which would have been the main reason for this scene in the early Republican period. The wish for longevity is symbolized by the boy holding a basket full of peaches, which, based on legend, grew in the garden of the Daoist goddess Xiwangmu, Queen Mother of the West, and which conferred longevity on all who ate them.